Welcome back to my blog. 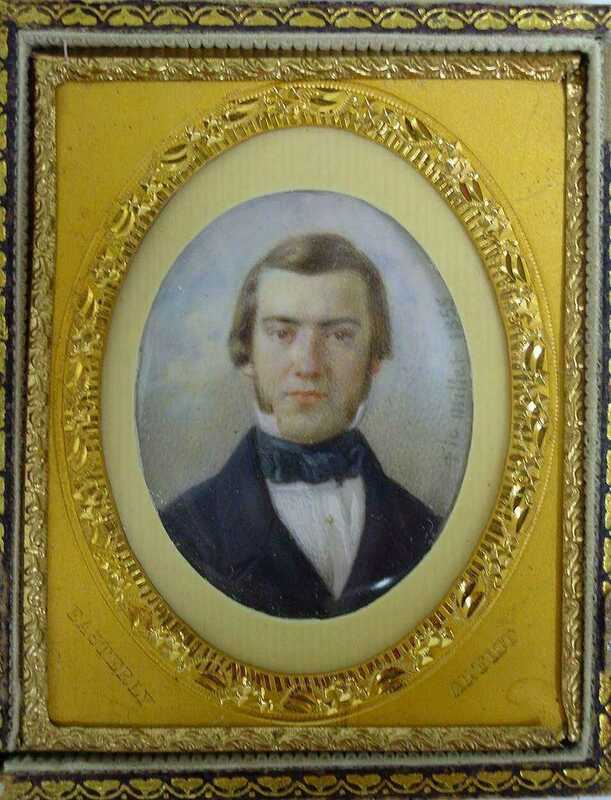 The image above is not a tintype, but a miniature of Henry Chouteau (painting on ivory) in a daguerreotype case from the St. Louis Photographic Gallery for Thomas Easterly. I bet your perplexed why I am using the example above to make a point about the tintype of the child holding the flint lock rifle. Often, there is question if the image was later put into a photographic case and that is why my tintype and clothing expert have different dates when this child was photographed. 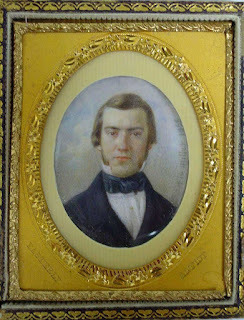 If you recall in my last 2 blogs, my tintype expert based her analysis on the mat was patented in 1861 and my clothing expert said the style was a passing fad in 1851-1854.
long after the fad had passed. Did they never mount a tintype AFTER the fact? Yes, Matthew wondered if the case was a later additon. The case had an 1861 mat. I see 1856-57 too....The good part is the date has narrow down to only a few years- very impressive! I took these photographs in the lab while Robin Jaffe Frank took a closer look under the microscope. She concluded that the quality of painting was excellent, but as a representative of Yale, she could not verify if the painter was the Millet who was famous for the paintings in France but gave me the name of an expert who could. 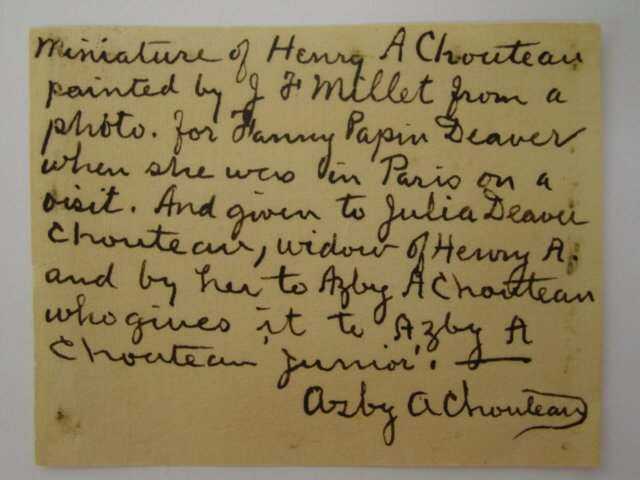 Unlike the tintype, the miniature of Henry Chouteau had the note (ephemeral piece) that allowed me to research the image. I have found support verifying Fanny's trip to Paris, but in 1857 not 1855. Without the note, this would have been just another nice looking miniature of average looking man and thrown away years ago.